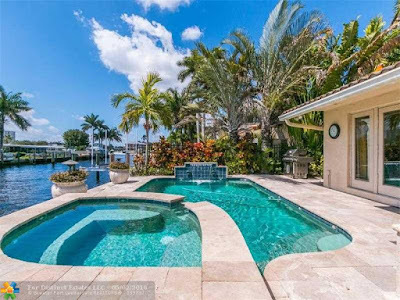 Broward Real Estate: Waterfront Home On The Market In Lauderdale By The Sea! Waterfront Home On The Market In Lauderdale By The Sea! Private gated island in the envied community Terra Mar Island Estates is on the market. This fabulous home comes with your own private deeded beach club in the sun drenched beaches of Lauderdale By The Sea. This is only the second house off the point from the intracoastal with fabulous wide open water views. This has seventy five feet of pure waterfront. There are gorgeous tray ceilings showcased in living room. The updated chef's kitchen has custom cabinetry, under and over cabinet lighting, sleek granite counter tops, and a full suite of designer stainless steel appliances. There is serene recessed lighting in the living room. There is television lighting and art spotlights to enhance home decor focal pieces. The custom sparkling pool and spa is the perfect place to relax and enjoy the scenic vista. The gorgeous paver pool deck area and driveway is another added bonus! There is lighting in the garden and around pool area as well.The private beach club has ample parking for cars. This is a must see home! 3210 S Terra Mar Dr located in Lauderdale By The Sea and is currently asking $1,049,000.00.